You can order via our secure website 24 hours a day, however if you'd rather order by telephone our friendly Customer Service Team is available Monday-Friday 9:00am-5:30pm on 020 8275 5220. Please note PayPal cannot be used for telephone orders. When you add items to your basket you'll be shown a basket summary before you check out. Simply click on "Discount Code" in the basket summary, type or paste your code into the box and click "Go!" Your basket total will update to show the discount applied. You must enter your discount code in the basket as you won't have chance to apply it later on. If the discount code box is missing this means that no further discounts can be applied to the product(s) in your basket. Only one discount code can be used per transaction. Do I need to choose a date or location before I buy my voucher? Nope - this is the advantage of buying from us! There's no need to make up your mind about your preferred date or location of a particular experience before you place your order. Our vouchers are valid at all of the locations that are shown in the 'View on Map' tab on the product page - you or the recipient can decide where and when to take your experience at any time before the voucher expires. New locations are often added to our experiences so make sure to check https://myvoucher.buyagift.co.uk/Account/MyVoucher when booking to see the full range of venues that you can choose from. Vouchers may only be redeemed with participating suppliers. Please note that unlike our regular experience vouchers, Print & Go vouchers for print-at-home entry tickets to theme parks or attractions are date specific. You must choose the date you want to visit when you place your order. Your ticket will only be valid on the date you pick. You will need to take the payment card with you along with your printed voucher on the day. Can I check availability before I buy a voucher? Does the voucher need to be in my name / Can someone else use my voucher? None of our vouchers have any name attached to them until a date for the experience is booked with one of our suppliers, so the voucher can be used by any recipient that you choose. No names, apart from any included in the personal message that you can choose to enter at the basket page, are printed on the voucher. If the voucher is being delivered to you then the voucher will be marked for your attention when it is dispatched but this will only be shown on the covering letter and not on the voucher itself. Please note, if you order a Print and Go voucher for dated attraction tickets, you must show the card used to purchase your tickets upon entry to the attraction otherwise entry will be refused. How will my gift be packaged? Both packaging options will fit through any standard sized letterbox and there is nothing on the packaging to give the game away about what is included inside! If time is of the essence, we also offer e-vouchers which are sent directly to your email address. Please call us on 020 8275 5220 (Mon-Fri from 9:00am-5:30pm) as soon as possible after placing your order to make any amendments. Our orders are all processed very quickly so it may not be possible to amend once your order has been processed. My order has gone through twice - what should I do? Don't worry - if you make a mistake or change your mind we can help. Please contact us to arrange a refund of your duplicate order. How does the Best Price Guarantee work? We want you to be sure you're getting the best deal on the web. Do you have a refer-a-friend scheme and how does it work? Yes, we have a refer-a-friend scheme. If you like us enough to recommend us we'll happily give your friends an introductory discount and give you a thank you. What we offer changes over time so please click here to go to the current refer-a-friend scheme. Our refer-a-friend scheme enables you to share with your friends using your name. This means that you can simply tell your friends to come to Buyagift.com and enter your name and they'll be given their discount code. Tell your friends to click on the link asking if they've "Been referred by a friend?" in the Buyagift checkout and enter your name. You can also recommend us by link, email, on Facebook or on Twitter. I've been referred to Buyagift.com by a friend and they said I just need to enter their name to get a discount that they offered me. Where can I do this? You can do this either on the homepage or as you're buying from us. There is a link just above the voucher code box during checkout saying "Been referred by a friend?". Alternatively you can click here to enter your friend's name. Once you've confirmed the friend who referred you, you will be able to access your reward. You can then enter this code in the voucher code box as you're buying. I've referred someone. How do I know whether they've bought anything and whether I've got a reward? We will email you as soon as any rewards are due. The email will have come from refer-a-friend@mention-me.com as Mention Me are the company who manage our refer-a-friend scheme for us. It is also possible to see the status of your referrals on your dashboard. You can find a link to your sharing dashboard at the bottom of the email you receive when you sign up for our refer-a-friend scheme. Do I need to choose a date or location before I buy a voucher? Nope - this is the advantage of buying from us! There's no need to make up your mind about your preferred date or location of a particular experience before you place your order. Our vouchers are valid at all of the locations that are shown under in the 'View on Map' tab on the product page - you or the recipient can decide where and when to take your experience at any time before the voucher expires. New locations are often added to our experiences so make sure to check https://myvoucher.buyagift.co.uk/Account/MyVoucher when booking to see the full range of venues that you can choose from. Vouchers may only be redeemed with participating suppliers. I have a voucher - how do I book my experience? Visit https://myvoucher.buyagift.co.uk/Account/MyVoucher and log in using your reference number and pin code found on your voucher. Once logged in, you'll be able to view a map pinpointing the experience location(s). For more specific information, click on your chosen location on the map or select it from the list on the left hand side. Here you'll see the supplier name, address and contact details for all the suppliers who accept our vouchers for your chosen experience. When you've picked your preferred location, get in touch with the supplier using the contact details provided and they'll get you booked in! Do I need to pre-book my experience? Experiences must be booked in advance with the experience supplier using the contact details provided at https://myvoucher.buyagift.co.uk/Account/MyVoucher, unless otherwise clearly stated in the product information. We always advise making your booking as far in advance as possible to avoid disappointment. Please also note that some experiences are weather dependant (e.g. flying lessons, driving experiences) so availability can be limited during winter months. If you already have a voucher, please visit https://myvoucher.buyagift.co.uk/Account/MyVoucher to check available locations and get the info you need to make your booking. I've made a booking with my voucher but need to change the date - how do I do this? All bookings are made directly with the experience supplier and any changes are subject to the supplier's terms and conditions. If you want to make any changes to an existing booking, you must contact the supplier of your experience directly. If you don't have their contact details to hand anymore, simply login with your voucher reference number and PIN at www.buyagift.com/myvoucher and you will have access to all the relevant contact information. If you can't log into the My Voucher site please contact us and we will be happy to provide the contact information for you. How long have I got to use my voucher? Most of our vouchers are valid for ten months from the date of purchase, however some vouchers are valid until a fixed date. The validity of each experience is clearly stated in the product information on the website, and will be printed on your voucher. You must make your booking and take your experience before the voucher expires. Can I extend my voucher? If you want more time to use your voucher, don't worry, most vouchers can be extended online, subject to a £20 fee. If the experience has increased in price since your voucher was purchased, you will also need to pay the difference between the value of your voucher and the current price of the experience. Simply visit https://myvoucher.buyagift.co.uk/Account/MyVoucher and enter your voucher reference and pincode. The new expiry date and anything to pay will be clearly shown before you make any payment. Your voucher may be non-extendable if it was purchased as one of our fantastic special offers or if we no longer offer the same experience. If your voucher cannot be extended you have the option to exchange it for another experience and can pay to extend the date on your new choice. Can I exchange my voucher? The great thing about Buyagift vouchers is that if you don't fancy the experience you have a voucher for, you can exchange to your choice of thousands of other experiences. So if a bungee jump isn't your cup of tea why not swap to a spa day, afternoon tea or day out with the family! Simply login with your voucher number and pincode at https://myvoucher.buyagift.co.uk/Account/MyVoucher and click on 'Exchange my voucher'. You'll be shown the wide range of experiences that you can switch to, along with the difference in price between your original voucher and new one. Where you see "Add" the new experience is more expensive than your original voucher, so you would need to pay this amount to exchange to the new experience. Where you see "Bank" the new experience is less expensive than your original voucher, so if you exchange to this experience you would receive a credit voucher of this value to use towards another experience in future (the expiry date will be clear on your credit voucher). New vouchers will have the same expiry date as your original voucher. If you want longer to use your new voucher you can extend and exchange at the same time. Simply tick the 'extend my voucher' box and for a £20 fee your new voucher will come with ten months' validity starting from the date that you make the transaction. Please make sure you exchange your voucher before the expiry date printed on your voucher. During busy periods it may take up to 12 hours to receive your order confirmation email, but don't worry we have your order and are working on getting it to you as soon as possible! You will receive an email link to your e-voucher pdf once payment has been made. You can then print your voucher at home. If we receive your order prior to 4pm Monday to Friday your gift will be delivered between 8am and 8pm the next day (excluding Sundays and Bank Holidays). Orders placed after 4pm on Friday and until 4pm Monday will be delivered between 8am and 8pm the following Tuesday. *Please note that if you order multiple Smartboxes these will each be posted separately so may arrive to you on different days. You will only be charged once per order. Can I send the gift to someone else? Absolutely - simply enter the recipient's details when prompted for a delivery address. We won't post anything to this address except the gift so you don't have to worry about the recipient receiving any invoice information! Can I send a gift abroad? Our experience vouchers can be sent anywhere in the world! Worldwide standard delivery can take between take 2-4 weeks so if you'd like the voucher quicker, just select our e-voucher option at the basket page. Unfortunately courier delivery is not available for addresses outside of the UK. When placing your order please 'Click here to enter the details manually' button found under the post code box on the address details pages. Standard Delivery (£1.99) Orders placed before 3pm will be dispatched and delivered within 2-3 working days. If the estimated delivery time for your order has passed and your gift still hasn't arrived we recommend checking with your local sorting office to make sure the item hasn't been taken there after a failed delivery attempt. If you still have concerns about the arrival of your order please contact us and our Customer Services Team will look into further for you. I've lost my voucher - what can I do? We know how easy it can be to misplace things, so getting a replacement voucher is not a problem. Please contact us and we can arrange for a free replacement voucher to be emailed straight to you to print out. 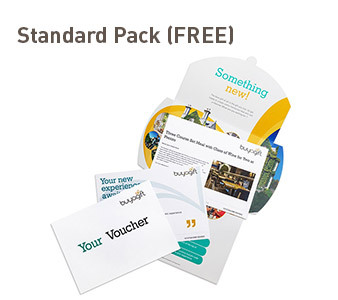 Alternatively, if you'd like a new voucher posted to you, we can do this for a £10 fee. My order hasn't arrived yet - can I get a replacement? Delivery times vary by product. Please check the 'DELIVERY INFORMATION' tab on the product page on the website for specific details about the item you ordering. We're happy to refund unused experience vouchers within 60 days of purchase. Once you or your recipient has redeemed your voucher and booked an experience with a supplier you are bound by their Terms and Conditions. Please make yourself aware of these at the time of booking. All refunds will be made to the person who purchased the voucher, directly to the card used to make the purchase. All refunds are processed at month-end and take between 5 and 10 working days to show in the purchaser's account. To request a refund please call our friendly customer service team on 0208 275 5220 and select the option for an 'unwanted voucher' to discuss your options. If it's more than 60 days since you placed your order, we are more than happy to exchange your voucher for any other experience on the website, up to the value of your current voucher. I'm having problems logging in to my voucher - what should I do? Check that the website printed on your voucher says https://myvoucher.buyagift.co.uk/Account/MyVoucher a small number of our vouchers may direct you to a different web address. 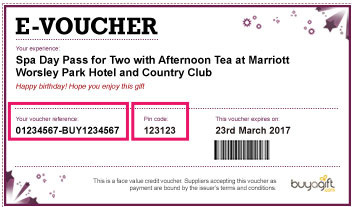 Please make sure you enter these details exactly as they appear on the voucher. If you have purchased an e-voucher it can take up to 2 hours to automatically process on our system so please wait until this has passed before trying to access your voucher. If you're still having problems please contact us and our Customer Service Team will be happy to help. Do I have to do the experience before my voucher expires? Can I change/cancel my booking? All bookings are made directly with the supplier of the experience and any changes are subject to the supplier's terms and conditions - please make sure that you understand their rules on changes or cancellations (particularly at short notice) when you make your booking. If you want to make any changes to an existing booking, you must contact the supplier of your experience directly. If you don't have their contact details to hand anymore, simply login with your voucher reference number and PIN at https://myvoucher.buyagift.co.uk/Account/MyVoucher and you will have access to all the relevant contact information. What happens if my experience is cancelled? In the event that your booked experience is cancelled by the supplier of the experience, they will arrange to re-book you at a convenient time. We recommend contacting the supplier of the experience before you travel, to ensure that your experience will go ahead. We cannot be held liable for any costs incurred in the event of a booking being cancelled. I don't want to do the experience - can I swap to something else? Where you see 'Add' the new experience is more expensive than your original voucher, so you would need to pay this amount to exchange to the new experience. Where you see 'Bank' the new experience is less expensive than your original voucher, so if you exchange to this experience you would receive a credit voucher of this value to use towards another experience in future (the expiry date will be clear on your credit voucher). Can someone else use my voucher? None of our vouchers have any name attached to them until a date for the experience is booked with one of our suppliers, so the voucher can be used by anyone that you choose. If you've already made a booking with the voucher and want to change the participant name, you will need to get in touch with the experience supplier as amendments to bookings are subject to the supplier's terms and conditions. If you no longer have the supplier's contact details to hand you can find them by logging in with you voucher details at https://myvoucher.buyagift.co.uk/Account/MyVoucher. If you have any money left over from a previous exchange this will be given in the form of a credit voucher. To use your credit simply visit https://myvoucher.buyagift.co.uk/Account/MyVoucher and login using the reference number and pincode printed on your credit voucher. You'll be shown the wide range of experiences that you can put your credit towards, along with the difference in price between your credit voucher and the experience you want. Where you see 'Add' the new experience costs more than the credit you have, so you would need to pay this amount. Where you see 'Bank' the new experience costs less than the value of your credit, so if you exchange to this experience you would receive a new credit voucher of this value to use towards another experience in future (the expiry date will be clear on your credit voucher). 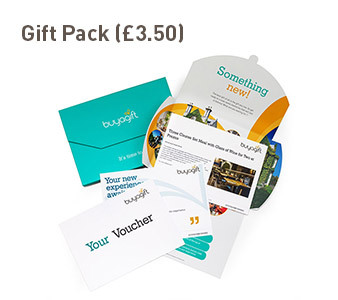 Credit vouchers can only be used against experiences available at https://myvoucher.buyagift.co.uk/Account/MyVoucher, and cannot be used against non-experience gifts such as hampers and wine. Please make sure you use your credit before the expiry date printed on your voucher. Can I combine the value of more than one voucher? If you're lucky enough to have more than one of our vouchers, then yes, you can combine the value of the vouchers and exchange to something more expensive or choose more than one experience. Select this button and fill out the details of your other voucher(s) to automatically combine the value and put towards your experience(s). You can do this for as many vouchers as you want to add together! If you choose to extend the validity period of your new vouchers, you will only be charged one £20 extension fee per transaction and this will give all of your new vouchers a 10 month validity period. I can't find what I want to exchange to - can you help? Your voucher can be exchanged for any of the thousands of experiences that you can see when logging in to https://myvoucher.buyagift.co.uk/Account/MyVoucher. I have more than one voucher - can I combine their value and exchange to something else? Yes, you can combine the value of the vouchers and exchange to something more expensive or exchange to more than one experience. Once you have logged in at www.buyagift.com/myvoucher with your voucher reference and pincode and clicked on 'Exchange My Voucher' you'll find a box marked 'Add another voucher' at the top of the screen. Do I have to use my voucher before it expires? Yes - you must book and take the experience before the expiry date printed on your voucher. If you are unable to use your voucher before it expires, you can extend it on https://myvoucher.buyagift.co.uk/Account/MyVoucher.